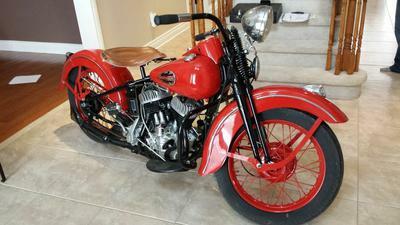 This 1941 Harley Davidson WLA has been completely restored. It just needs a minor tune up by a professional vintage bike mechanic. The tune up will be in terms of the spark plugs, oil change, brakes, etc. because the rest is finished on this bike. This is ideal for a museum but could be a good weekend rider. Ninety percent of this WLA is original. The ten percent that is not is just the smaller stuff like reproduction bolts and nuts, that sort of thing. It was purchased from a museum and it needed work, which all of it has been done, except for a final tuning as described. It's a 1941 WLA which is hard to find, and the title on this motorcycle is clear. You might find it still for sale under the eBay id mfedoration. Very very nice To bad us old guys cant be restored back to near perfect LOL. Nice looking WLA. 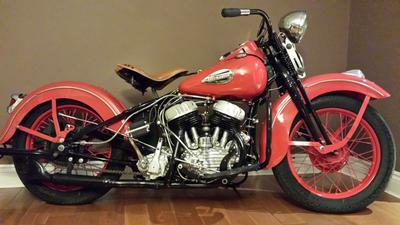 Would love to take her for a ride, and then home, so I might 'ride it like I stole it'! Join in and write your own page! It's easy to do. How? Simply click here to return to WLA.